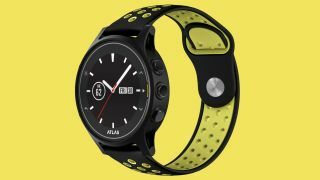 Atlas is returning to the world of fitness watches, and the company's latest - the Multi-Trainer 3 - is capable of automatically tracking over a thousand different types of exercise. It has been two years since Atlas released a fitness watch, and this latest aims to be an all-round workout tracker that's capable of helping you monitor a variety of exercises around the gym without the hassle of programming them into a device. You'll get heart rate and rep counting information in an easy-to-read app experience, which is all detected by the watch itself. Have you considered the Apple Watch 4? It uses machine learning to be able to do this, which comes from information the company has recorded over the last five years since its first wearable release. Atlas hasn't named all the activities you can track, but exercises included in a screenshot of the app include Dumbbell Row, Dumbbell Pull-Over, Dumbbell Deadlift and Side Blank Rear-Delt Raise. The watch itself is very light at 31g, so it shouldn't cause a nuisance on your wrist when you're wandering around the gym. The display is color and comes with an always-on functionality, but we don't currently know many specific specs about it. There's a heart rate monitor that can also track your heart rate variability to give you a clearer picture of your heart health when you're at the gym too. As for a release date, you're likely going to have to wait a while. You can apply to buy one from Atlas, but that process can take up to two months, or otherwise the company expects the Multi-Trainer 3 to hit shop shelves normally this Christmas. How much you'll be spending on the watch is also unclear. Did you hear about the Runtopia S1 running watch?